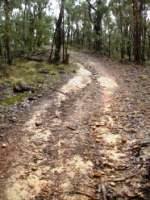 Yes but this a trail more suited to day rides. 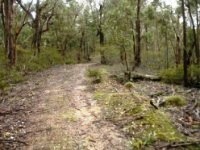 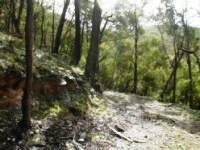 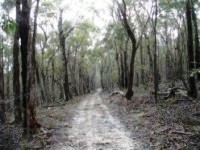 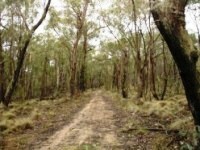 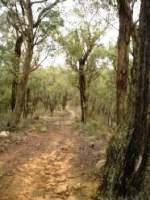 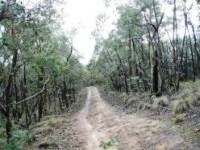 The Blackwood Ranges Track consists of a number of tracks connecting the end of Swan Road north of Bacchus Marsh to Mount Blackwood. 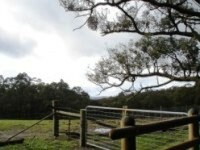 The track is a designated horse and cycling track under the Lerderderg Management Plan and can be legally ridden on. 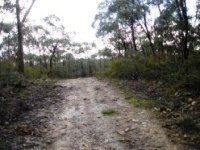 The track rises from 360 metres to 720 metres at the Mount Blackwood gate. 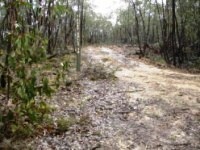 Track length is approximately 12 km each way. 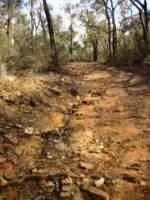 The track has a number of very steep climbs along the way - some which may have to be walked if wet and possibly even when dry if you can't keep the grunt work up. 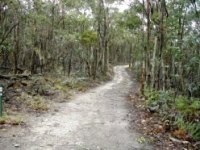 On the day I rode the trail, it took me two hours to ride up (admittedly taking the attached photos, consulting maps, etc) on a showery day and about an hour to ride back. 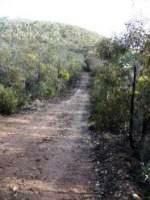 I found the general downhill on the way back from Mount Blackwood allowed speed to be gained allowing the up hill bits to be more readily 'roller coastered' up than in the uphill direction. 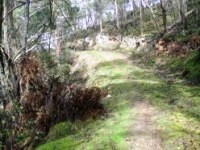 Just keep an eye out for walkers on the way down as you will get up some speed in places. 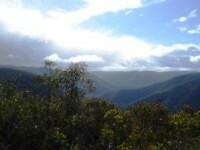 Typically you won't see anyone but it makes it all the more surprising when someone is actually out there. 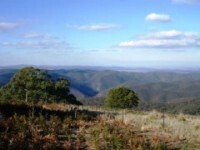 There are some good views of the gorge to be had, the forest near Mount Blackwood is also quite nice and the views from Mount Blackwood are absolutely spectacular. 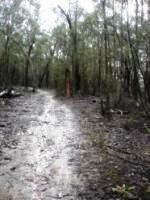 The trails are wide all of the way with the major technical issues being washout sections which are fairly slippery in the wet. 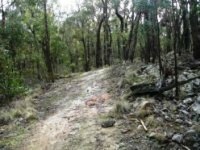 On dry days, they could be readily ridden at higher speed with the loose rock surface in sections providing the other challenge. 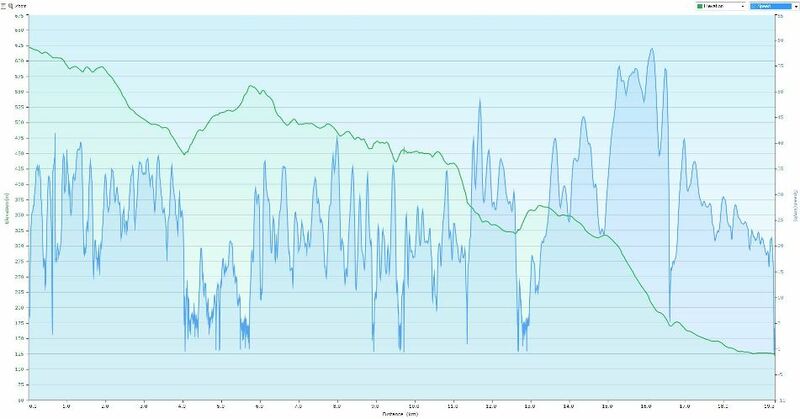 An elevation - speed profile from another time I rode the trail is provided below starting at the Mt Blackwood end and heading down to Bacchus Marsh. 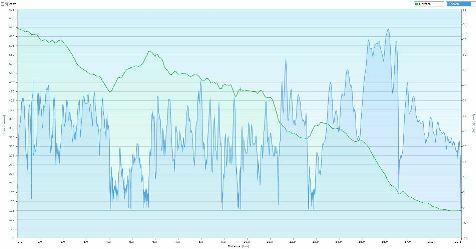 Note the bitumen drop into Bacchus Marsh (past kilometre post 11 on the graph) is well worth the effort for the downhill run as well - just keep an eye on the speed limits! 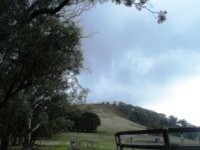 If you can get someone to shuttle you up, it's well worth the effort to do the full run back to Bacchus Marsh. 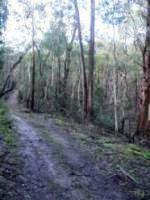 Another alternative is to ride up to Mt Blackwood from Bacchus Marsh on the bitumen. 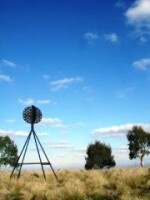 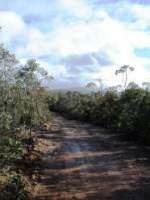 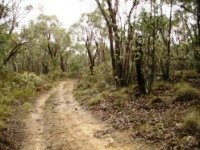 Take the Old Western Highway and then Mount Blackwood Road - quite a nice ride for a road ride. 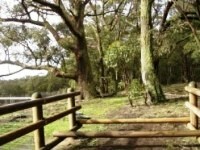 On the trip shown below, the trip inside the park limits took 40 minutes. 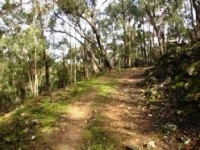 The trip below was 19 kms into Bacchus Marsh north and took 1 hour and 2 minutes (and it was hot so probably not as fast as a cool day). 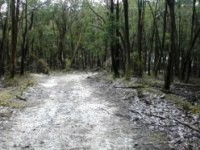 The following photo gallery has been taken in order from the Swans Road end of the trail. 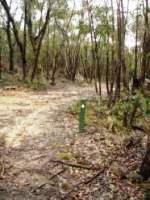 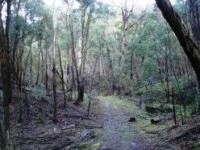 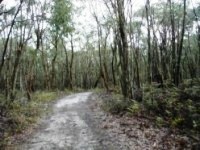 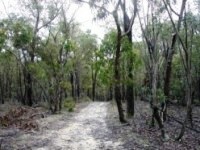 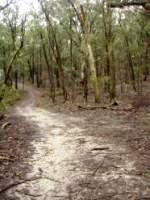 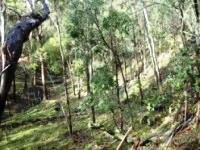 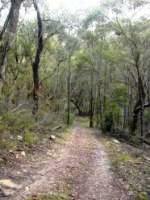 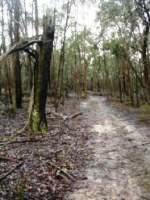 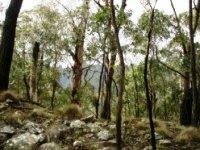 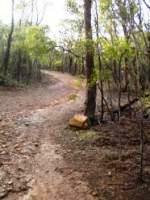 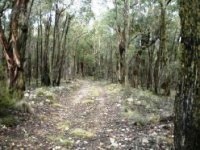 The trail follows Blackwood Ranges Track, Clifford Track and then Foxy Gully Track. 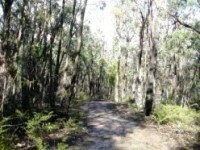 Heading north from start of trail at end of Swans Road. 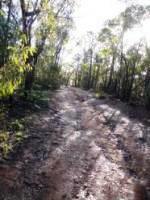 The track climbs very steeply from the car park - this is a hike-a-bike section for most people but is not very long. 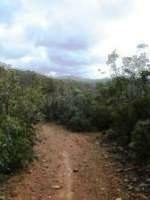 Head up the track until you reach the intersection with the Link Track across to Mc Kenzies Flat. 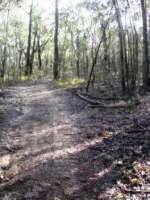 The trail then tends to flatten out a bit as it starts to follow a ridge line. 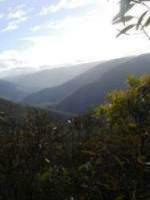 You can get some good views over the gorge from up here. 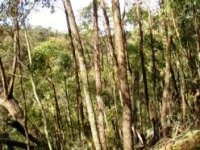 Views up the gorge in photo on right. 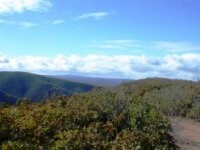 Panoramic views of the gorge. 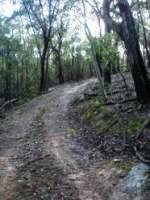 The track varies between reasonably flat sections to short but very steep uphill sections. 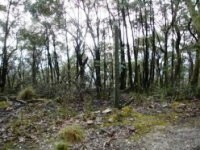 Above photos show intersection with Long Point and Bears Head Track. 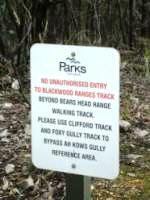 Follow Clifford Track as per sign. 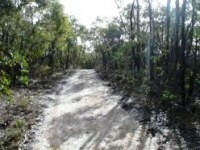 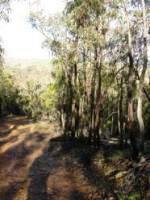 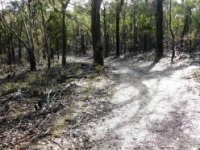 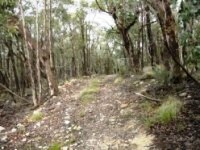 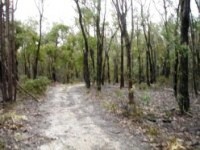 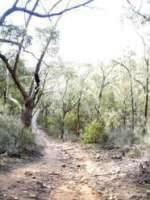 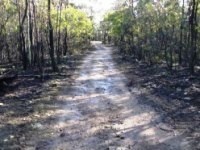 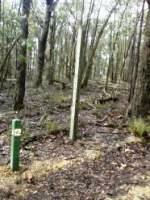 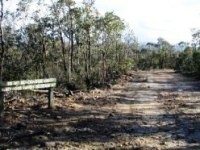 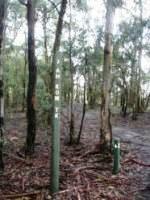 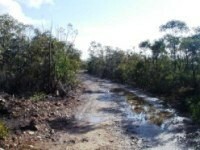 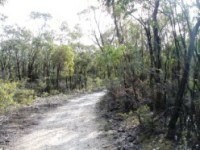 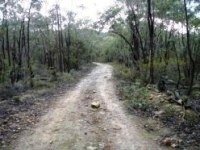 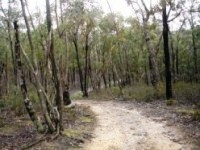 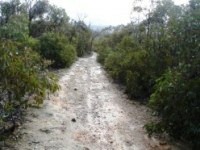 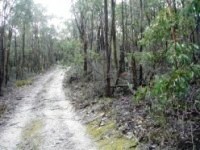 Photo on right shows intersection with Foxy Gully Track - follow this track to right, Clifford track heads off to left. 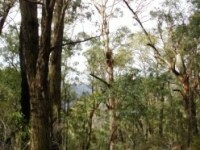 Further climbing required in the following photos. 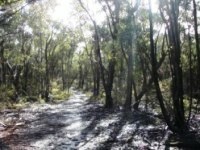 Forest becomes a bit more lush in this area. 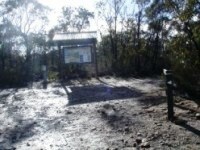 Gateway to Ah Kow Area just prior to Grassy Gully Track. 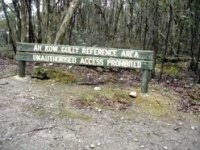 The Ah Kow Reference Area is on the right of the trail so keep out of this area. 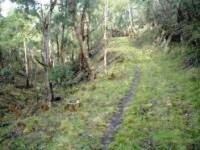 Grassy Gully Track intersection in left photo and Ah Kow Track intersection in right photo. 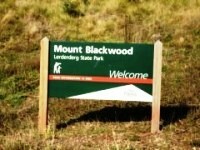 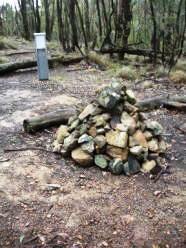 Base of Mount Blackwood - keep following Great Dividing Trail up to Mount Blackwood for a great view. 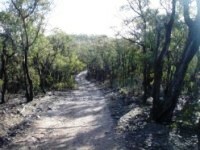 Refer Mount Blackwood Road ride for further information on how to continue on from Mount Blackwood towards Blackwood. 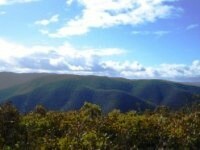 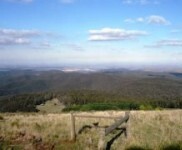 Spectacular 270 degree views from Mount Blackwood - well worth the ride up from the end of the Blackwood Ranges Track. 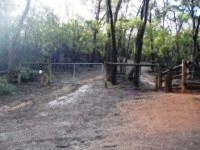 Parking is available at end of Swans Road at park entry gate. 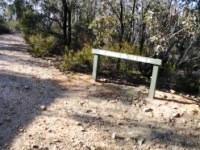 No toilet facilities are available. 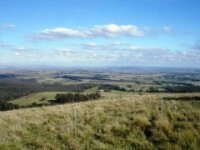 No food or drinks are available in the immediate area. 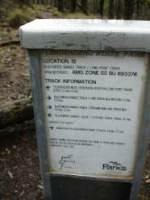 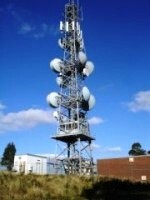 No local information facilities are available.